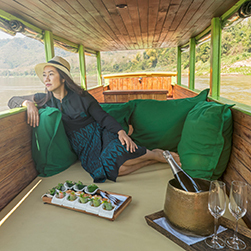 With our insider knowledge of Southeast Asia’s idyllic destinations, we can arrange special experiences of romance, adventure, and shared learning that help strengthen the bond and create meaningful memories to last a lifetime. Blessed with tropical natural beauty and omnipresent Balinese Hindu traditions, spirituality and culture, plus an infectiously laid-back vibe, this Island of the Gods provides wondrous sights, activities and experiences to share together for long-lasting memories. CAN'T FIND WHAT YOU'RE LOOKING FOR? JUST BECAUSE IT'S NOT HERE DOESN'T MEAN WE CAN'T MAKE IT HAPPEN. CONTACT US TO START PLANNING TODAY. 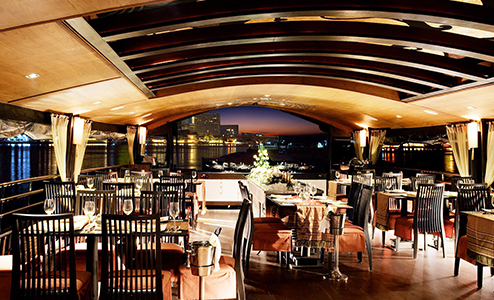 For the ultimate in fine-dining and romance, while in Hong Kong, whisk your beloved away on a private three-hour dinner cruise. From the pier at Aberdeen, embark on your very own luxury yacht, booked exclusively for the two of you and cruise along Hong Kong’s southern shoreline. 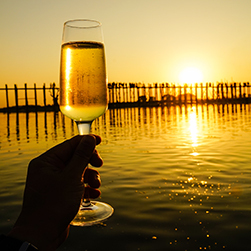 While a four-course dinner is being prepared by onboard chefs, relax together on the front deck with a glass of wine or Champagne in hand, enjoying magnificent views in complete privacy. Your private yacht will sail to either Deep Water Bay, Repulse Bay or Stanley, whereupon an exquisite candle-lit dinner will be served out on deck. Moored close enough to Hong Kong’s glittering skyline, but removed from the city bustle, savour the tranquility of the open sea and one of the most romantic nights imaginable. 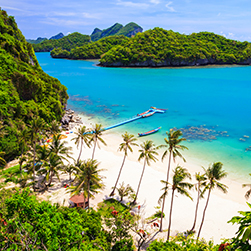 The Ang Thong National Marine Park in the Gulf of Thailand is home to 42 islands, most of them uninhabited and undeveloped. Spend a lazy, sun-kissed afternoon sailing the turquoise waters around the 102 sq km marine park on a luxury catamaran, taking in the gorgeous panorama above the water of limestone islands covered with tropical forests. 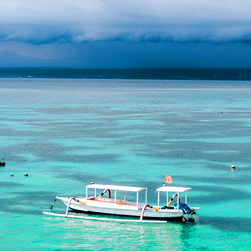 Don a mask and snorkel to explore the splendid scenery below the water of coral reefs and schools of tropical fish. Enjoy snacks and drinks as the sun sets over the gulf. Coral Island (locally known as Koh Tan) is exactly what most travellers picture when they think of the perfect small island hideaway. 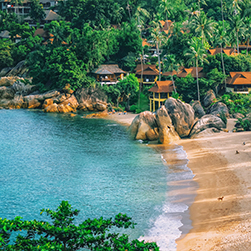 Less than 30 minutes from Thong Krut Village on Koh Samui’s southwestern coast lies this tiny jewel measuring just 8 sq km. 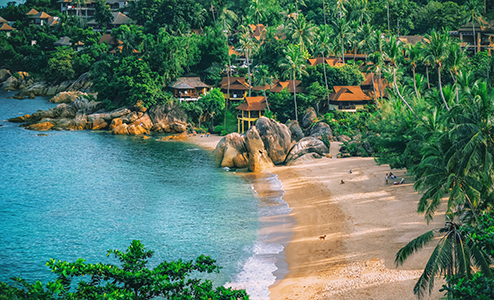 The crystal waters around Koh Tan boast some of the best snorkeling in the area, with a protected reef teeming with fan corals and colourful marine life, including giant clams and many fish species. The island itself is home to just one small fishing village with no roads, cars or dogs, creating a quiet, castaway vibe. Spend the day enjoying Coral Island’s unspoiled beaches with a picnic lunch served in your own little private spot. Ubud is known for its stylish spas and quiet retreats, but this afternoon, prepare to take the art of relaxation to another level. 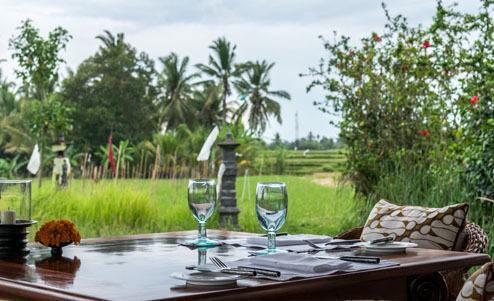 Journey outside of Ubud to a luxurious tented camp that exudes an aura of colonial chic hidden amongst the rice fields. In a floating tent by the sacred Ayung River, enjoy a 60-minute foot bath and body massage in this most serene of settings. Sit down to a sumptuous high tea with sweet treats and savoury hors d’oeuvres in a Balinese silk-paneled tent. Enjoy watching a Balinese dance performance, an artistic form of storytelling incorporating graceful hand gestures and alluring eye movements, all set against a magical forest background to complete your day of pampering in the Balinese countryside. 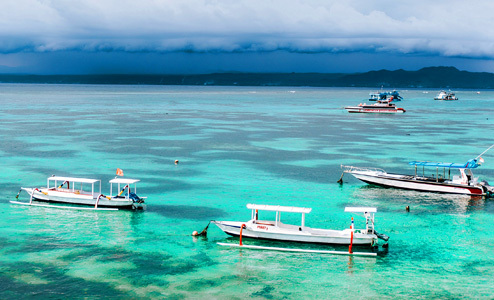 Situated off of Bali’s southeast coast lies the paradise island of Lembongan. 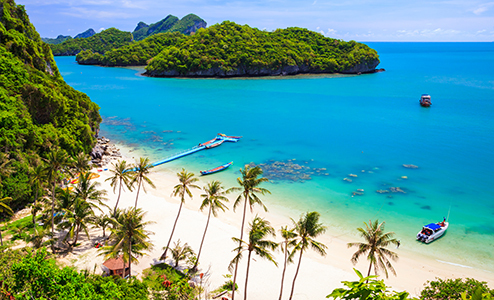 Measuring just 8 sq km (3 sq mi), the island offers clear, blue waters and white sand beaches with no hawkers or traffic to dispel the quiet, relaxed atmosphere. Enjoy a leisurely sail through the Badung Strait on a 16m (52ft) private luxury catamaran, enjoying fresh juices, coffee and pastries on board. Sometimes playful dolphins can be spotted in the warm waters during the 2-hr cruise. At the Reef Club on Lembongan Island, sit down to a BBQ lunch on arrival with the rest of the afternoon at leisure to sunbathe or swim. 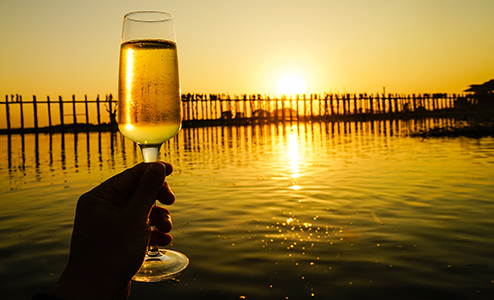 On the return cruise, enjoy the sunset over the seascape around you with a cocktail in hand. Thanks to significant preservation efforts, not much has changed in the Bagan landscape since the city reached its height between the 11th and 13th centuries, when more than 10,000 temples, pagodas and monasteries dotted the plains. Life still moves at a languid pace for many, especially along the banks of the mighty Ayeyarwady. 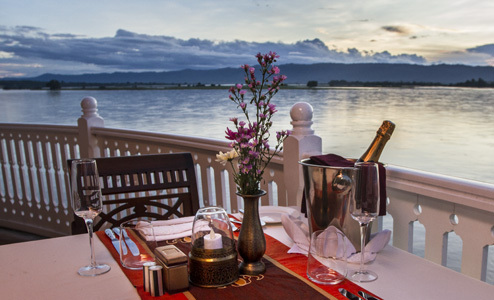 Spend a beautiful evening aboard a one-hour sunset cruise, cocktail in hand, as you observe timeless river scenes slowly glide on by of women handwashing clothes on the banks, children playing in the river and fishermen angling for the day’s catch. Watch as the sky changes from pinks and reds to yellows and oranges with shades of deep purple before the sun finally sets on this “’Land of a Thousand Pagodas”. One of Myanmar’s most photographed sights, the 1,200m (3,937ft) U Bein Bridge is the world’s oldest and longest teakwood bridge. When the capital moved from Amarapura to Mandalay, wood salvaged from the Inwa Palace was used to build the bridge across Thaungthaman Lake to provide children with access to the monastic school and for locals to reach markets and important religious sites. Board a rowboat and enjoy sunset cocktails and snacks as the captain maneuvers into the perfect spot from which to view this timeless scene of villagers and visitors walking across the bridge silhouetted against the orange glow of sunset with the bridge reflected in the water. Luang Prabang regularly tops the list of the most romantic destinations in Southeast Asia for its clean, quiet streets lined with some three dozen UNESCO-protected temples and beautiful heritage buildings recalling slower, gentler times. 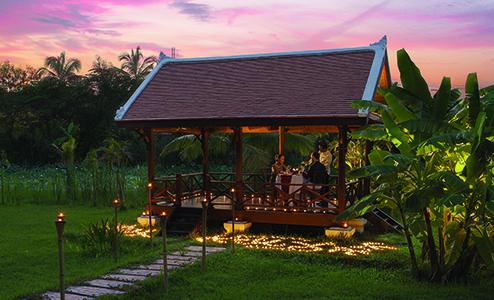 Experience a truly unforgettable gourmet dinner for two in a private setting illuminated by 500 flickering candles enhanced by music provided by a traditional Lao musician. After an aperitif at the bar of one of the town’s finest hotels, take your seat at private table for two nestled in an elegant garden pavilion overlooking the orchid ponds. 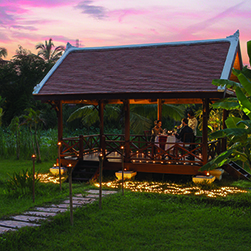 Savour a sophisticated 7-course Lao or Western dinner, with some of the courses prepared and served tableside, part of a magical evening not soon forgotten. The Mekong River plays a vital role in the lives of many as a means of transport and commerce. For visitors, the Mekong’s ginger-coloured waters are also a source of incredible rustic beauty. 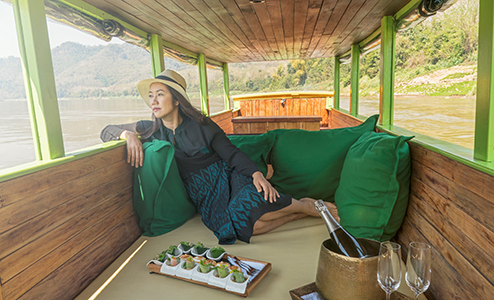 Spend a late afternoon cruising downstream on the Mekong, taking in picturesque riverscapes of local villages, banana plantations, and swaths of forest. Enjoy the serenity of the moment with the gentle lapping of the water against the boat providing the soundtrack for this relaxing experience. 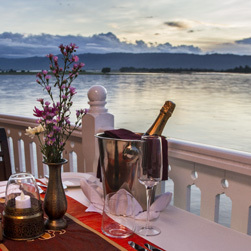 Feel the cool breezes off the water as your private butler serves you a glass of champagne (or soft drink) and canapés as you watch the sun setting over the Mekong and surrounding hillsides. Not too far from the UNESCO-inscribed Hoi An Ancient Town are quaint villages where people continue to live a rustic lifestyle of farming and fishing. 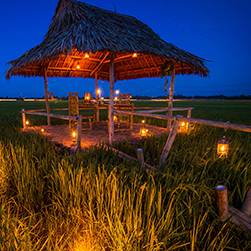 Spend a magical evening at Cam Thanh Village known for its peaceful waters flowing past dense water coconut jungles and immense rice fields. Board a circular bamboo basket for a gentle ride along the picturesque Co Co River to reach your destination. 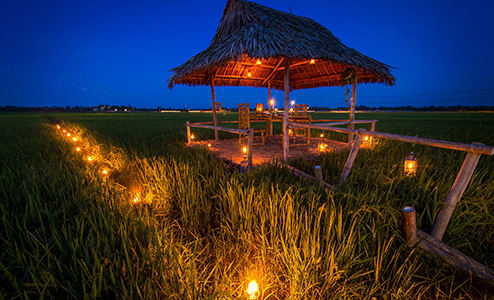 Set next to the river within a secluded rice field is a private tent all set-up awaiting for your arrival. Savour an incredibly atmospheric candlelit BBQ dinner with fresh caught seafood and locally grown vegetables for a truly authentic and romantic experience.